Bruschetta al pomodoro is simplicity itself – so why write a post about it? While the list of ingredients is short and the preparation straightforward, there are a few things worth knowing that can make the difference between a mouthwatering crispy delight and a confused, soggy mess. I’ve been served so many disappointing, and frankly odd, versions of tomato bruschetta that it seems worth setting down how to do it right. 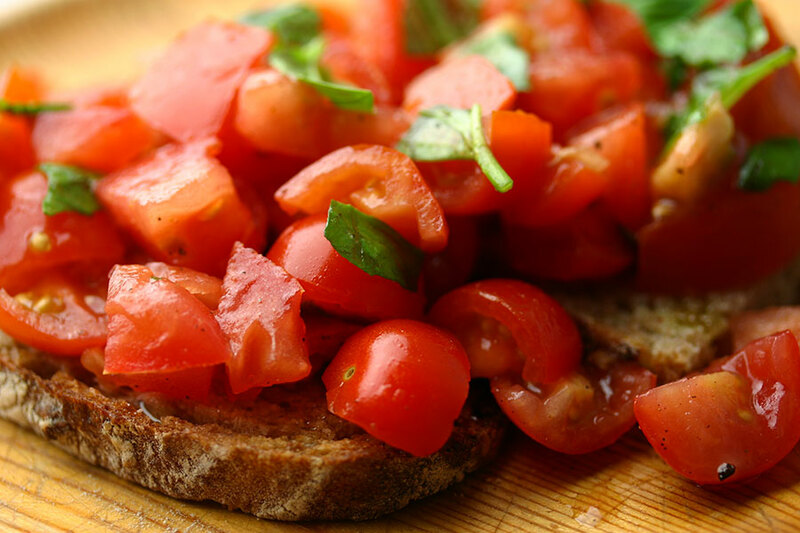 Bruschetta al pomodoro involves only bread, tomatoes, garlic, olive oil, basil and salt. There’s no need for balsamic vinegar, dried oregano, chilli flakes, sautéed garlic, grated Parmesan cheese or slices of red onion. The quality of the ingredients really makes a difference – ripe, juicy plum tomatoes, a good fruity olive oil, fresh basil and garlic, a pinch of Maldon salt. Choose a toothsome, country-style bread (preferably a day or two old). A baguette isn’t right here as it quickly turns soggy. This is how my Roman friend Mariella showed me to do it, and I’ve never seen the need to modify a thing. Preheat the top grill of the oven. Place the bread slices underneath and toast on both sides. While still hot, rub the crisp surface of the bread slices with the garlic. Place the bread slices on a serving dish and drizzle generously with olive oil. In a bowl, mix together the chopped tomatoes and basil. Pour over some more olive oil and season with Maldon salt, to taste. Mix to combine. Heap the chopped tomatoes over the slices of bread and serve. You’re right — I always think of Italy when I eat it! I think it makes a big difference – will be interested to hear what you think!